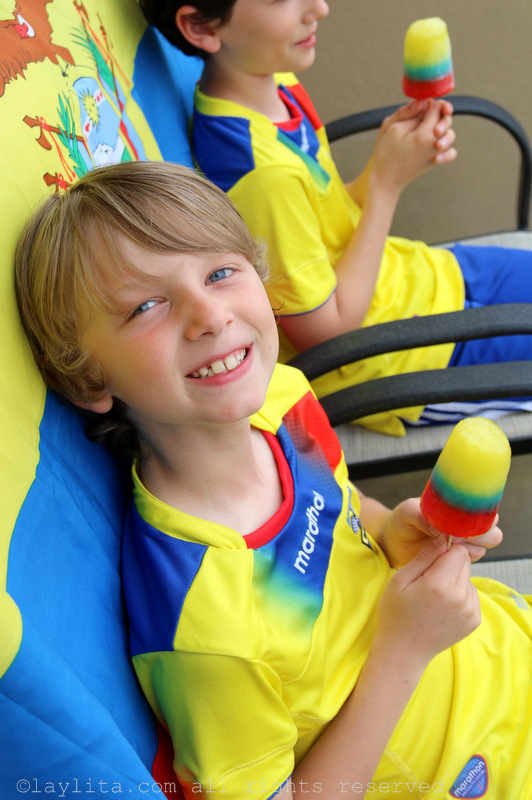 I made these layered gelatin flag popsicles to get my kids into the 2014 World Cup spirit, and now we’re making them again for the 2015 Copa America. I was planning to post the recipe sooner, but of course, as soon as the games started my productivity has dropped to zero – mainly due to exhaustion from screaming at the TV. It’s an understatement to say that World Cup craziness has invaded our home. My husband, despite being French, is not a huge soccer/fútbol fan. Even though I complain about his lack of enthusiasm, he watches the games but doesn’t get as emotional as the rest of us; and I have to admit, it probably helps us keep some minimal balance of sanity around here. 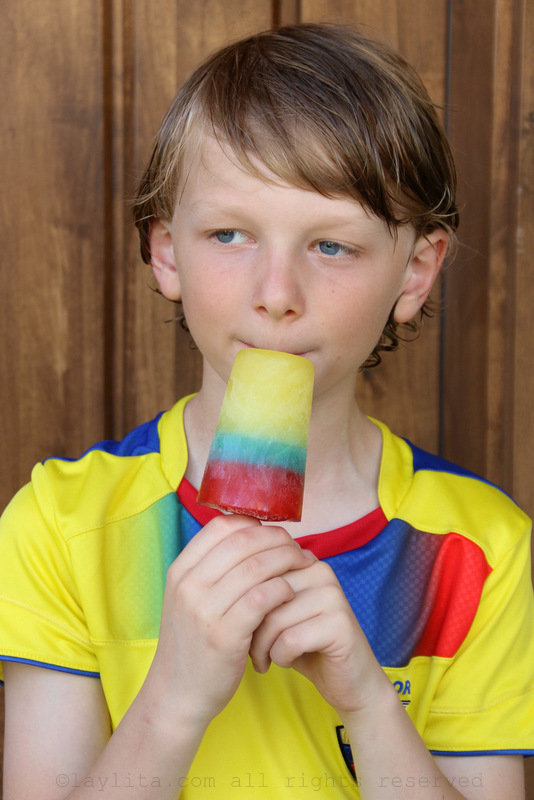 Easy recipe for layered gelatin flag popsicles made with flavored gelatin or jello, water, and sugar. 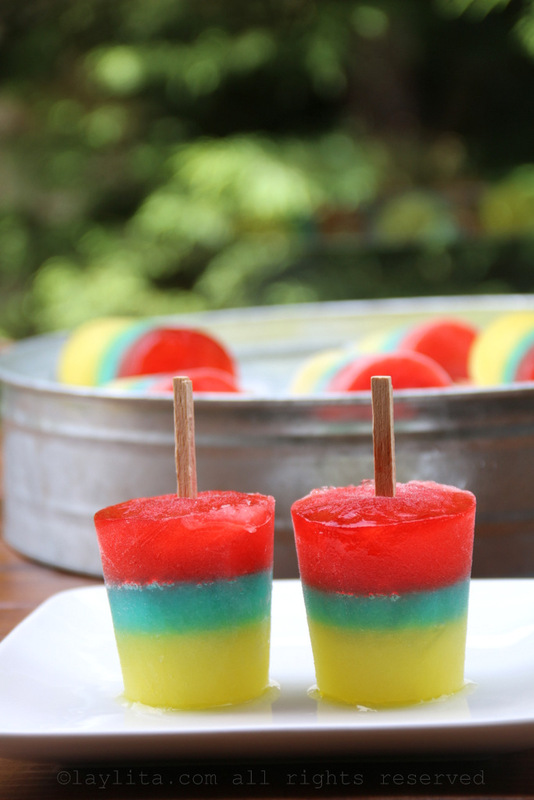 The perfect treat for your World Cup party. 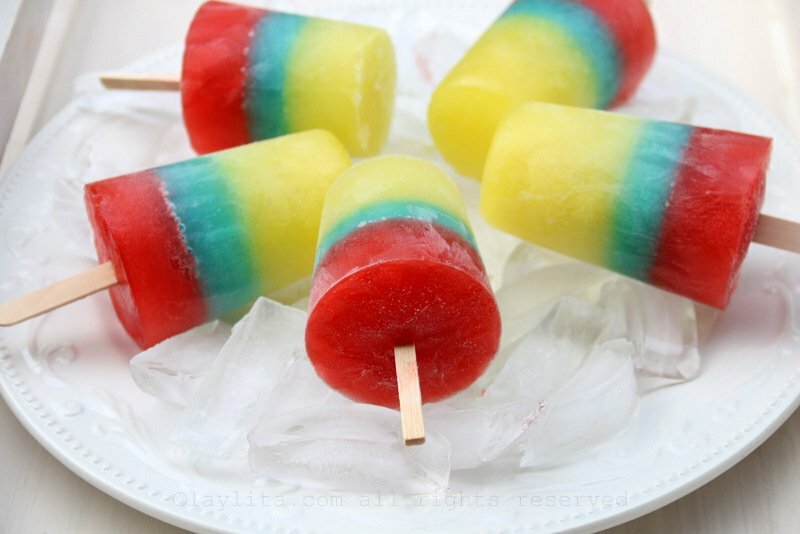 You will need to prepare each color/flavor separately and wait until each one is almost frozen before adding the next layer. 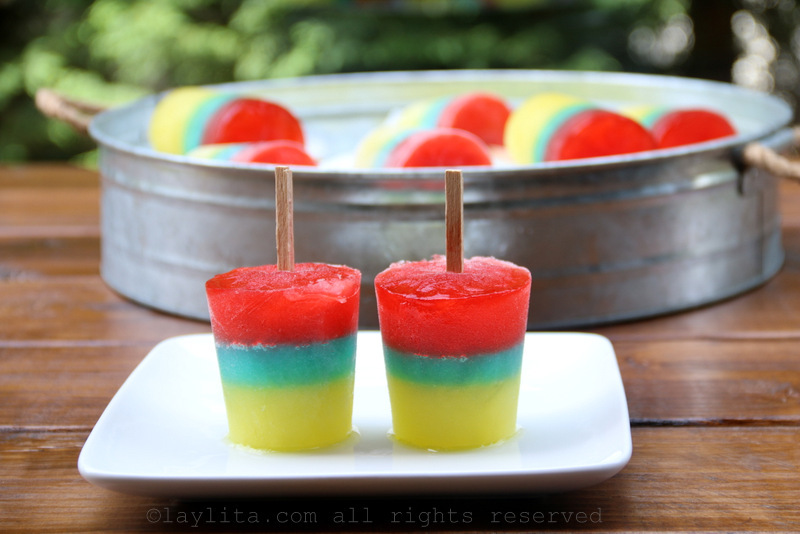 The first layer will be the color/flavor that is on top of the flag, in the case of these Ecuador flag popsicles, yellow or lemon is the first layer. 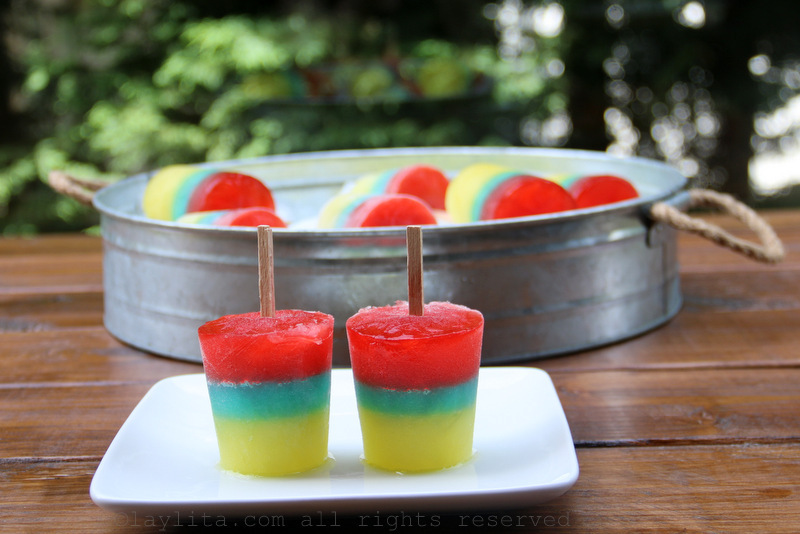 Also, because the Ecuadorian flag has a wider yellow stripe than the blue and red stripes, I used 2 packs of gelatin, but I didn’t double the water because I wanted to make sure I had an intense yellow color. 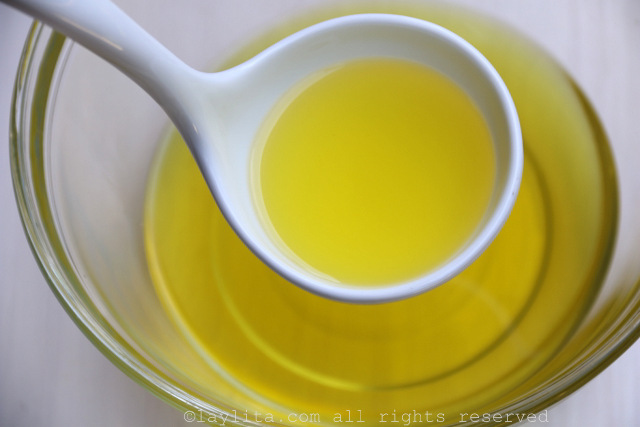 Mix the 6 ounces of yellow gelatin with 3 cups of boiling water, add ½ cup of sugar, and stir well until the gelatin and sugar are dissolved. Add 3 cups of cold water and mix well. 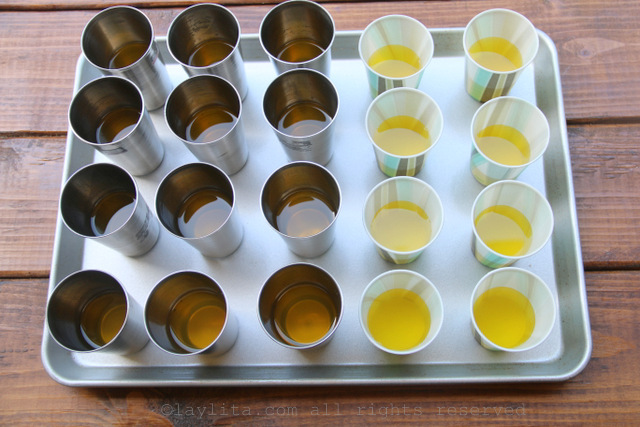 Fill each popsicle mold or cup to around ½ full; don’t worry if it isn’t exact for all the molds. If you don’t mind the popsicle sticks having a slight lean, then go ahead and add them at this point. 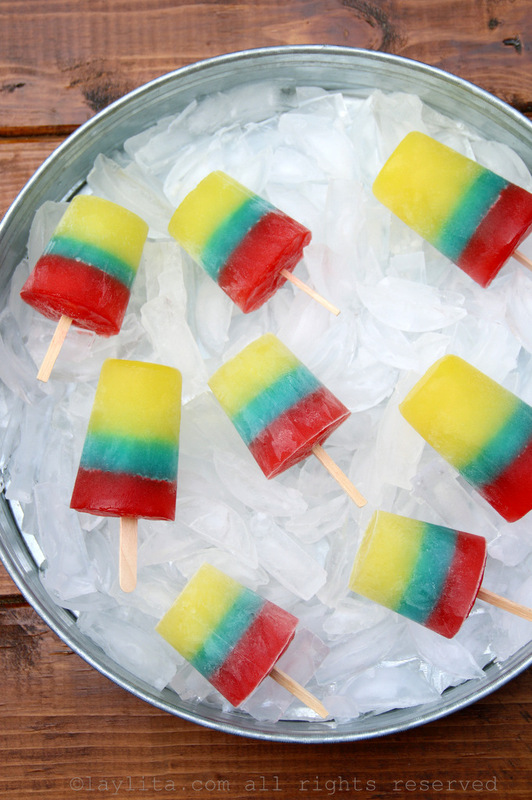 If not place the popsicles in the freezer, and add the popsicles sticks once the gelatin mix begins to solidify, about 1 to 1 ½ hours. Freeze the first layer for about 2 to 2 ½ hours or until almost frozen before adding the second layer. The first layer usually takes longer than the rest of the layers, and especially for the Ecuador ones since the yellow layer is larger than the others. About 30 minutes before the first layer is ready, start preparing the second layer, in this case the blue layer. 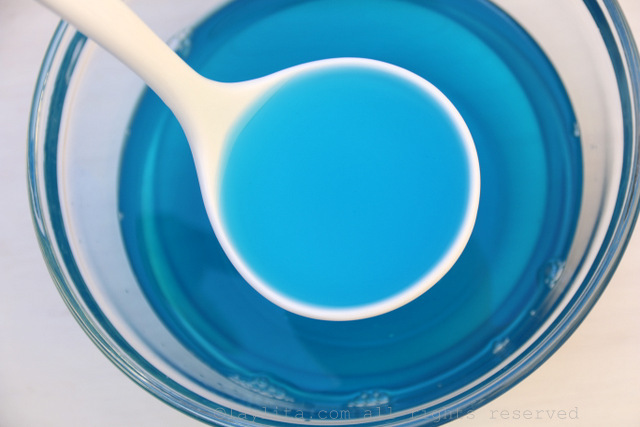 Mix 3 ounces of blue gelatin with 2 cups of boiling water and ¼ to ½ cup of sugar, stir it well until the gelatin and sugar are completely dissolved. Add in 2 cups of cold water and stir well. 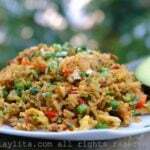 Let it cool down as much as possible at room temperature and without letting it set. Pour a layer of blue gelatin mix on top of the previously almost frozen yellow layer. Make sure you have enough room for the third/last layer. 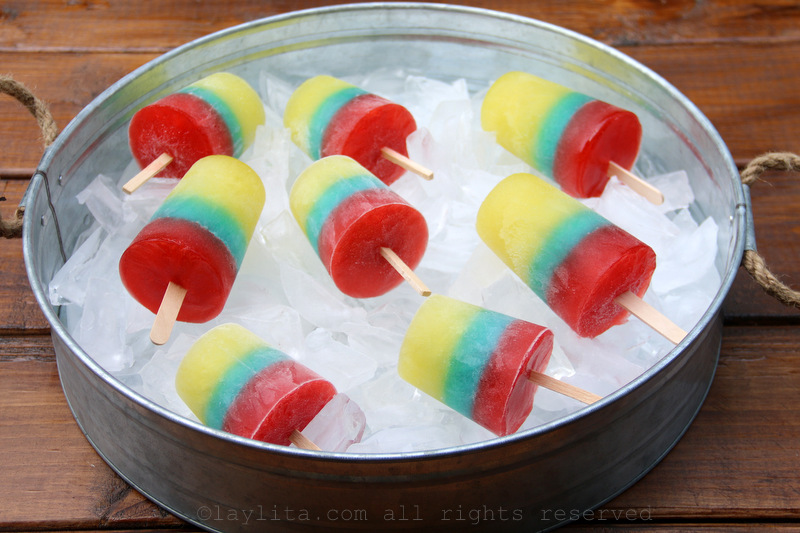 Freeze the second layer of the popsicles for about 1 ½ to 2 hours or until almost frozen. About 30 minutes before the second layer is almost frozen, prepare the third and final layer of red gelatin. 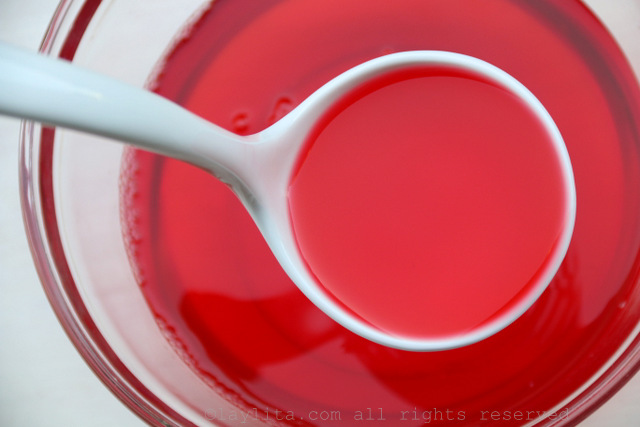 Combine the 3 ounces of red gelatin with ¼ cup to ½ cup of sugar in a bowl, add 2 cups of boiling water and mix well. Add 2 cups of cold water and stir well. Same as with layer #2, let it cool down a bit before adding it to the popsicle mold. When ready, add the final layer of the red gelatin mix to the molds. 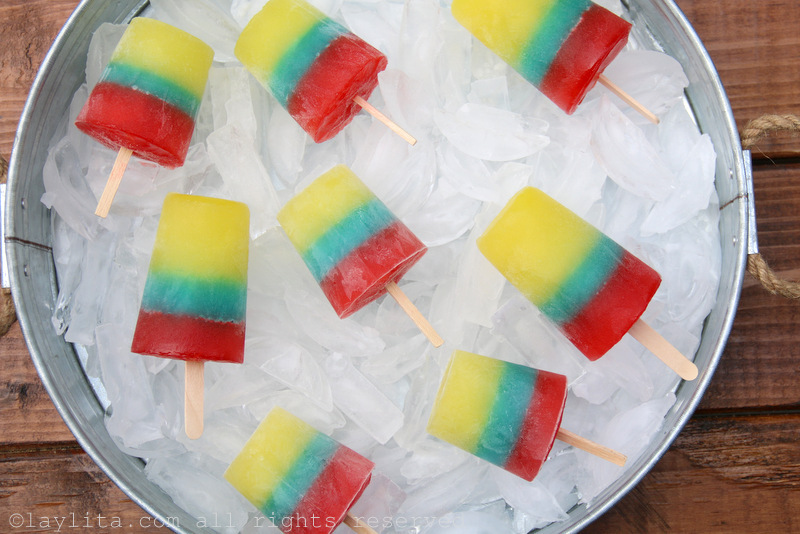 Freeze the gelatin flag popsicles until they are completely frozen, about 3-4 hours. To remove the metal molds, run the mold part under water for a few seconds and gently twist the popsicle stick while pulling the popsicle out of the mold. If using paper cups, simply peel the cups off. In case there is any doubt, my number one team is Ecuador. I also support the US and all the teams from Latin America, but my beloved Ecuador, despite its underdog status and heartbreaking loss with Switzerland has my entire support, regardless of how far we make it. I will be screaming “Sí se puede” until the last second of the last game –and yes, the World Cup makes me overly dramatic. 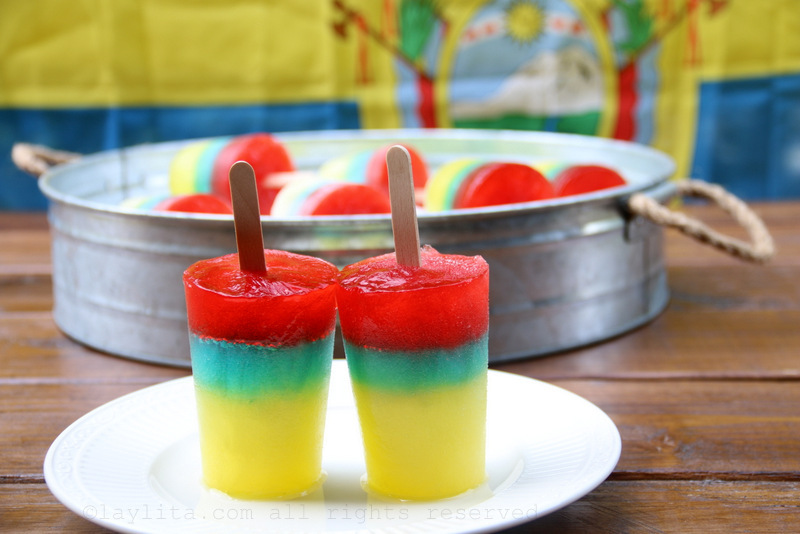 So, obviously I made these yellow, blue, and red flag popsicles to represent the Ecuadorian flag, the phrase “amarillo, azúl, y rojo, la bandera del patojo” is the first thing that pops into my head whenever I think of the colors of flag. 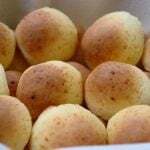 Of course, our neighbor country of Colombia, has the same colors on their flag, and they are also one my favorite teams, so you can also make them to support Colombia. 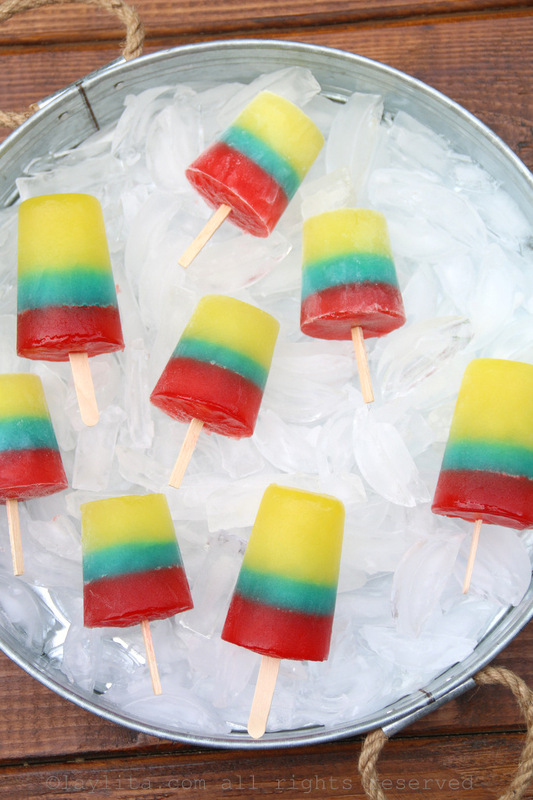 This recipe for gelatin flag popsicles can be easily adapted to represent the flags of different countries. Simply change the colors/flavors of the gelatin based on the country’s flag. My kids loved these and are also supporting Ecuador. 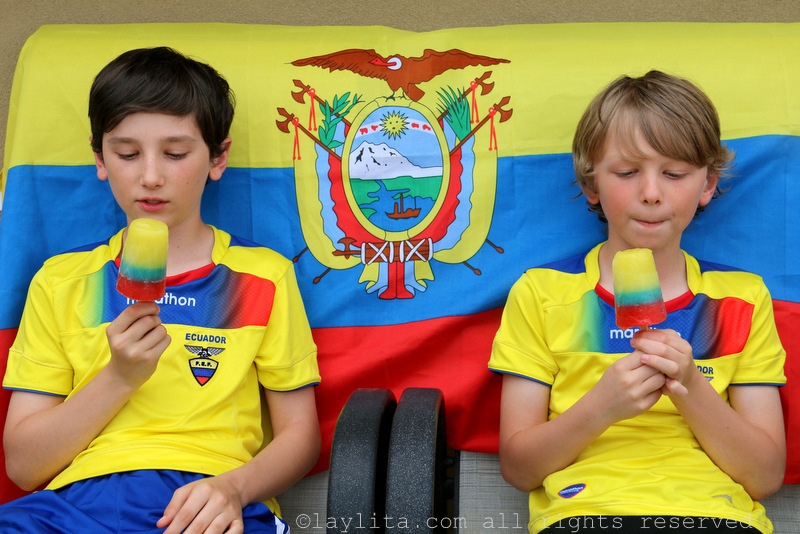 However, since they are both born here in the US, they are also supporting their home country – and torn about the possibility of both Ecuador/US playing together – and if that happens I would be thrilled because it would mean that both teams would be playing in the quarterfinals. They also requested red, white and blue popsicles to support the USA team, so I decided to make that variation using berries and will be posting that recipe soon (I hope). 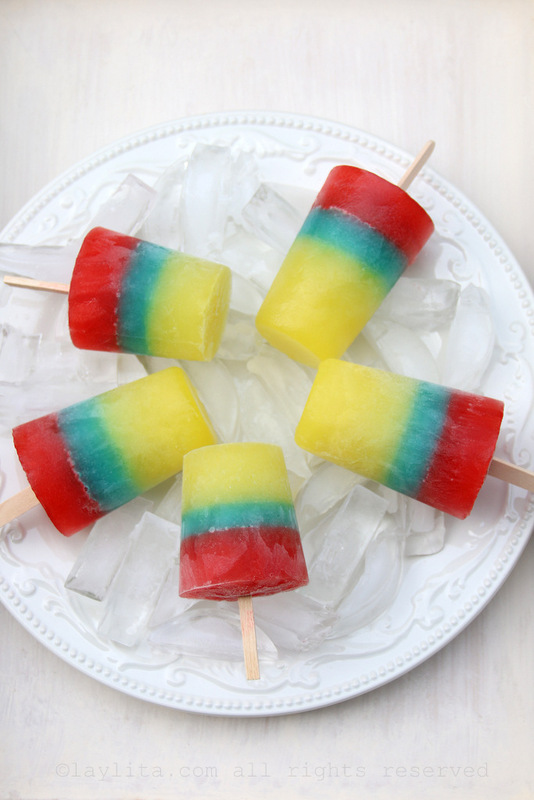 A few tips and observations from making these gelatin layered popsicles, one of the positive side effects of using gelatin is that the popsicles don’t melt as quickly – which is perfect for warm summer days. 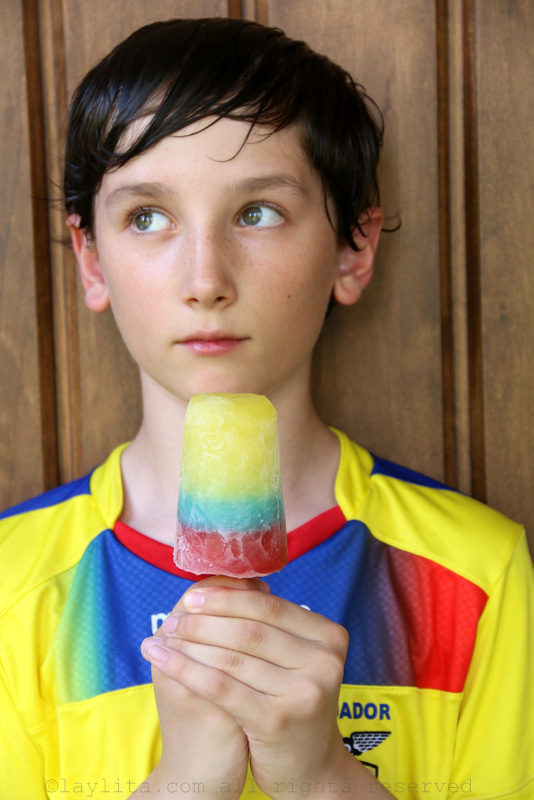 Gelatin popsicles are very popular in Ecuador; I grew up buying helados de gelatina from the local stores or tiendas, so they bring back a lot of childhood memories. When making them, you need to let each layer get almost frozen before adding the next layer, but don’t let a layer get overly frozen because it could prevent the next layer from sticking to it. 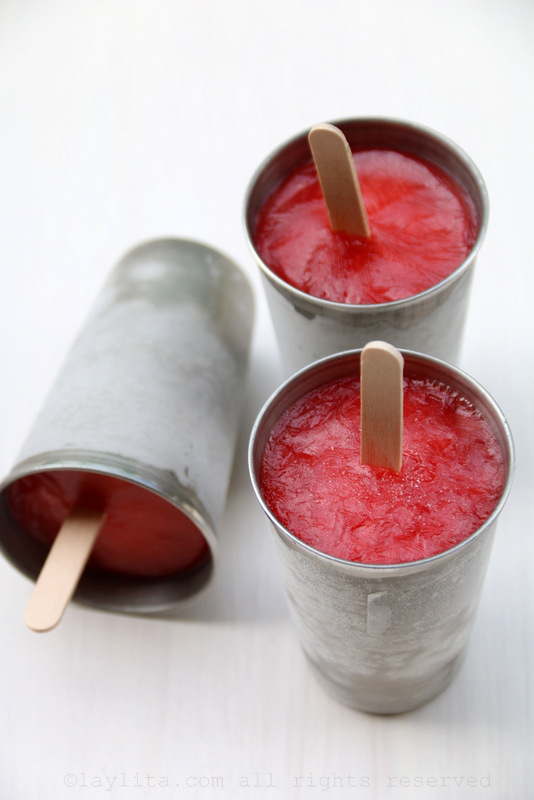 I used a combination of metal popsicle molds that I brought back from Ecuador, and also paper dixie cups. 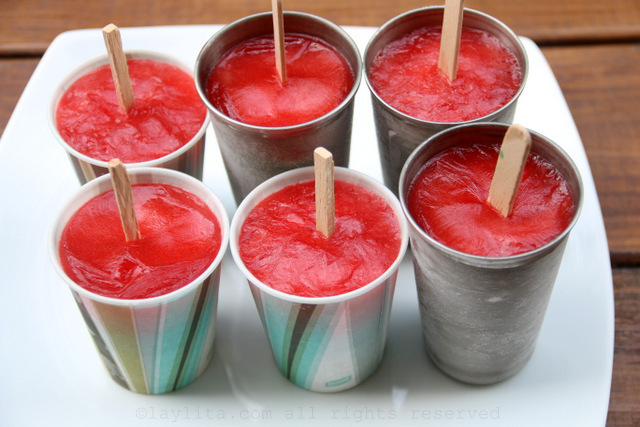 You can also use small plastic cups or regular popsicle molds. 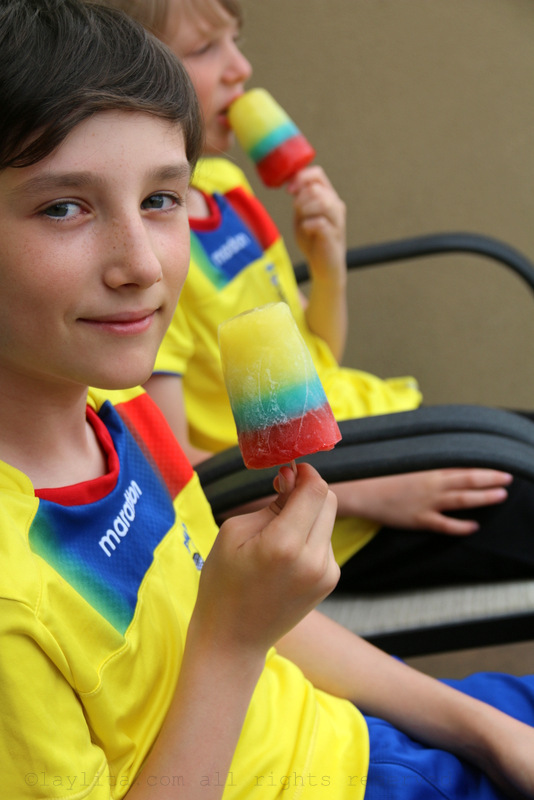 In Ecuador, they usually add the popsicle stick in at the beginning, so it ends up at a slight angle, you can do the same or add the popsicle stick as soon as the first layer starts to solidify. Good luck to all the teams and remember to support your team regardless of the results. Soccer can be very unpredictable, which is both good and bad, but it’s important to remember that the guys playing are usually giving their all, even if they are sometimes injured or having problems. And sometimes, as we all do, they make mistakes, so try to be understanding. I do have a hard time applying this same forgiveness to referees though (sorry refs – you guys have the worst job). And don’t forget “Sí se puede!” until the end. These are so pretty! We are cheering for Mexico, but support all Latin American teams—I can see a green, red and white version in my future! Great photos!